Before the plan to redevelop the Greer Stadium property even materializes as actual legislation, the proposal is receiving pushback from the at-large members of the Metro Council. The five at-large members — John Cooper, Erica Gilmore, Bob Mendes, Jim Shulman and Sharon Hurt — sent a letter to Mayor Megan Barry on July 19 expressing concerns about the Cloud Hill development. Cooper has already been outspoken against the proposal. At this point, the at-large members say they prefer for the property that previously was home to a minor league baseball stadium to be converted to parkland. The at-large members say they are especially concerned about tarnishing the historical value of the property. The site was home to an African-American encampment during the Civil War. The federal military base Fort Negley was built adjacent to the land, and that site has already been preserved. The nonprofit group Friends of Fort Negley and Civil War preservation groups have already announced opposition to the proposed project. 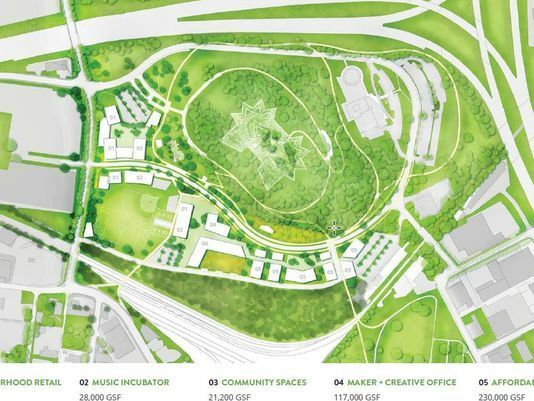 The Cloud Hill plan, a $100 million private development led by prominent developer Bert Mathews and music producer T Bone Burnett, would include 294 units of housing, around 80 set aside as affordable; “neighborhood-scale” market and retail, in addition to a dedicated park, open space and greenways. There also would be a cultural center for artists and musicians offering classes, maker space for artists, including filmmakers and musicians, and performance space. Earlier this month, Friends of Fort Negley pitched an alternative plan that would maintain the land as green space. In their letter, the at-large members called for Metro to conduct an archaeological study before redevelopment work begins. This is a stance that also is supported by the Metro Council Minority Caucus. “If development is to be considered at all, the better course of action would be to commission a proper study to locate the encampment and graveyard,” the at-large members said in their letter. In a letter responding to the at-large members, Barry defended the plan and asked them to keep an open mind. The council will have to approve any redevelopment plan, and Barry emphasized that the community will have a chance to give input to help shape the project. In response to the historical value of the property, she pointed out that the land now is home to an unused ballpark that sits in ruin. Councilman Colby Sledge, whose district includes the property, supports the plan. The at-large members represent all of Davidson County, instead of a specific neighborhood like a district council member. Barry served two terms as an at-large member before being elected mayor in 2015. For now, the at-large members say park space is the best plan for the former Greer site. The Cloud Hill proposal also has received pushback from the Metro Council Minority Caucus, which discussed the plan at its Monday meeting. Caucus chairman Scott Davis said the caucus wants to vote on the proposal before it goes to the full council. Davis said the caucus would like the city to pick the archaeological study firm and for the development team to pay for the work. He also said the caucus would like to hear from the Cloud Hill developers, and the plan is for a presentation to take place Aug. 14. Tom Middleton, a partner in the Cloud Hill development, said the plan is to complete an extensive study of the site before any other work begins. He said the archaeological study has been delayed because the Cloud Hill group’s winning bid is under protest from a competitor.